My first lists were hilarious - I neatly copied each rose variety, size, pruning requirements and so on into a spreadsheet. Roses which were suitable for tree-climbing had their own special page. Shade-tolerant climbers got special ticks. I thought it would be really difficult to train a climbing rose. I worried and worried that I'd chose the wrong type of climber. Now I know better - my climbing roses have done their thing, and I needn't have worried at all! My ramblers have been rampant, my archway roses have survived, and the roses in the trees haven't needed any help at all. I have made a few mistakes - my Banksia Lutea, grown from a cutting, has recently had to be seriously trimmed out of season (it was completely covering the washing line). My climbing Masquerade gets badly rusted, but it is a personal heritage rose (from my first garden). Coconut Ice is the fluffiest, prettiest, 'pastelest' rose in my garden. It's a modest climber, pale pink-white in colour. The flower colours are reminiscent of the classic sweets made by busy mums for cake stalls and school fundraisers. 'Puzzling' has been the word for the climbing rose on Archway Number 6 in the orchard. It was never recorded properly in my journal, and looked a bit like Abraham Darby when it was small. So that's what I called it back then. But no. I know better now. It's the Kordes bred modern climber Alchymist. Mermaid is a renowned country rose, thorny and unforgiving. She's not a pretty, pretty rose, and will try to strangle any person foolish enough to weed underneath or prune her. The single palish lemon flowers usually sit beside scruffy old buds - this rose is a bit rough around the edges. My Uetersen rose has been growing in the house patio garden for four years now. 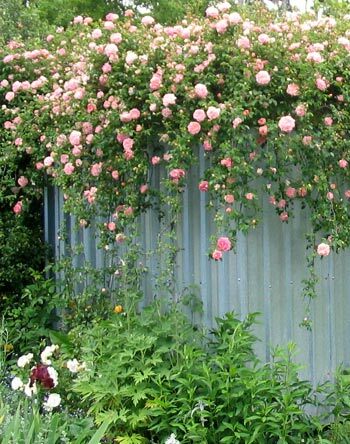 It is positioned sensibly in sun underneath a sturdy pergola post - because Uetersen is a most beautiful, well-known climbing rose. This honey yellow rose is a most successful roses for a country garden, blending the old-fashioned look with robust growth and repeat flowering. I grow it on the hitching rail by the Stables. And finally I'm sure I have it correctly identified - it's the Kordes-bred Maigold. I bought my first Moonlight rose after a serious bout of rose research. I wanted to grow roses other than the very modern ones, and the Hybrid Musks appealed as roses suited to a country garden. One of my best buys in the category of budget rose specials is a healthy climbing red rose called Santana. I've enjoyed it blooming for years in my garden without giving it much thought - or even remembering to say thank you! Oops. When I first wrote about the climbing rose Ghislaine de Feligonde I was rather rude. She was 'too small', with 'budget growth, budget sized blooms'... What an impatient rose gardener! Clair Matin rose - what a delightful, flowery rose you have grown into, now that I've pruned away the greedy, overhanging trees and given you more of the simple things in rose-life - sunshine and water! I bought the roses for the pergola in a bare-root rose sale frenzy. The climber Casino was a last minute grab-and-dash purchase. I knew it was lemon, and I was deep in my yellow-roses phase. When the first flowering roses are dead-headed (in theory) and resting in the mid-summer sun, this bright cherry coloured rambling rose starts to bloom. I think it's a modern variety - name unknown! Dublin Bay is a tall red shrub rose, usually grown as a small climber. It's a natural choice for a country garden, spreading itself easily on a fence or filling a space in a border. But... Sorry, but I like my red roses to be fragrant! The climbing rose Compassion grows up two of the pergola posts by the house patio. It's a sweet smelling rose with big blooms of salmon-pink shaded with apricot. My rose book claims that each flower has thirty-six petals - I haven't counted. Phyllis Bide is a restrained (almost shy) small climbing rose with fluffy pinkish apricot flowers. After rain they get beautifully speckled with darker pink spots. They remind me of flowers made of crepe paper. New Dawn - you have been a disaster in my garden, and I feel dreadful - you are such a popular rose, with such strong rose-credentials. Westerland is a very popular moderate climbing rose in New Zealand gardens. The flowers are apricot-orange, and the petals have a satin sheen. The lovely multi-coloured climber Masquerade is one of the early summer rose delights in the Moosey garden. But I should mention the rust that this rose seems to get - my Masquerade roses need to be sprayed. Every summer the beautiful climbing rose Cecile Brunner covers (or smothers) a fence and two cherry trees in the Driveway Garden with its delicate pale pink flowers. The pink rambling rose (Paul Transon) completely covers the roof of the woodshed. The canes drip down all sides, and are covered in early summer with a mass of crinkly pink flowers. And lots of thorns, ready to nip at anyone passing on a ride-on lawn mower and not paying attention... Ouch!